Grant writing can be a mystery that frightens and intimidates the best of us. Nonprofits new to grant writing may jump in head first without understanding the nuances of winning grants. Before we delve into this subject, let’s get some things straight: grant writing is not a one and done approach. Grants should be a larger part of game plan to help build relationships and to be sustainable. Your approach to grant writing should go beyond envisioning the next year, it's about how your organization will establish itself over the next 20 years. You should think to yourself, “How will the grants we choose to apply for, further our mission and get us that closer to our vision?”. Not, “how will this grant help us pay our bills"? Trust me, there will be moments, where you’ll be ever so grateful that a grant can help keep you afloat, but it should never be the only source or even the major source of income for your organization. You should be sure to have varied income streams to cover those expenses that often get overlooked, but are still necessary. Considering that it takes over a year for most nonprofits to receive their first grant, it makes it that more important to understand how grants should fit within your larger fundraising strategy. In thinking about whether or not you organization is prepared to pursue grants, it’s important to understand what funders are looking for. Think about it from their perspective. Funders are often accountable to Boards of Trustees, advisors, or other administrative officials, and they must prove that they’ve appropriately delegated the monies they’re responsible for. So instead of thinking why wouldn’t a funder fund me, look at it like this: Are we an organization a funder would want to fund? Has our organization taken the right steps to establish credibility in the community so that they trust us to use their money wisely? When you take a step back and understand how your grant fits into the big picture, then it becomes much clearer that your grant strategy should have its own mission and strategic direction. 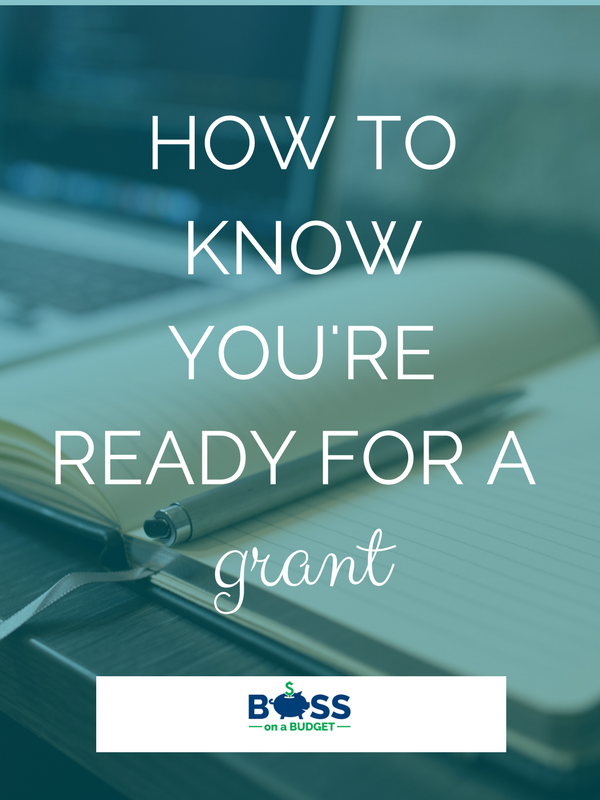 Below are the questions you need to ask yourself before writing your first grant. Do we have the staff we need to complete the proposal? Never underestimate the amount of effort it takes to complete a grant proposal. Even one that seems simple at the onset requires adequate time for research, planning, execution and follow-up. If you have multiple staff/volunteers, writing grant proposals requires coordination of staff across many different staffing levels-including program operations and administration. If you’re a one-person shop, you have to put on multiple hats when developing components of a proposal, which makes the process that more intense. The process will require multiple drafts and reviews, and a final proofreader to review your work. Coupled with the fact that the time window for writing a proposal can be 45 days or less, you must ask yourself whether you have the necessary time to get the job done. One of the first steps you must do in conjunction with developing your mission statement is understanding your why? Why are you needed? Who needs you? What major problem are you trying to solve? These questions will come up again and again in requests for grant proposals, and the answer to these questions will form the foundation of your ask. In layman’s terms, if you get the grant money, who will benefit-how and why? Why should your nonprofit exist? What makes your services unique or different? Why is this particular model of service of type of program appropriate for the population you serve? Your "why" should flow easily out of the development of your vision and mission and should be translated into a written statement immediately after you form your nonprofit. Does it align with our mission and/or strategic plan? There will be occasions where you will find a grant request that gives you freedom to design or maintain your program as-is. It is common, however, that nonprofits end up altering or enhancing components of their program to fit the guidelines of a funder. This is perfectly acceptable when the additional requirements improve the functioning of your program. For example, a funder may require outcome monitoring for your program, which will have an added benefit to the program. However, if your program services children only, and the funder only approves programs that serve adults, don’t make the mistake of stretching your program just to receive funding. Choose funders that align with the direction that has already been set by your leadership and your Board. Avoid shifting and changing your program on the fly, just to attract funding that you’re not guaranteed to get. Do we have key partnerships/relationships? Funders want to see that you have done the groundwork to develop strong partnerships with other community organizations or persons integral to your program’s success. Perhaps you’ve partnered with a consultant who’s an expert in a component of your program. Even better, maybe you’ve partnered with your local university to provide interns or to help design a small program evaluation. Remember to put yourself in the mind of your funder. If they can see that you’ve made key connections on your own, you appear much more stable and likely to be around for the long haul. When funders make judgements about who and what to fund, they want to make sure the organization on the receiving end has the capacity to do what they claim to do in their proposal. Organizations with strong networks look more capable than those with none. Do we fit the funder’s guidelines? Funders are great at telling you what they want and what they don’t want. If only all relationships were that easy! The first thing you should do when going for a grant is to read the funder’s guidelines. If there’s any doubt about whether you fit or not, contact the funder to clarify. If it’s clear that you're not a good fit, then stop there. Do not convince yourself that if you meet their guidelines “a little bit”, that it’s still worth it to apply. You are wasting your time and the funder’s time. Don’t turn them off but not doing your legwork to determine if you are a good fit or not. Are we clear about the goals/objectives of the project? Your grant proposal is the blueprint for your program's implementation. This is one of the sections where you must be as detailed as possible explaining how the grant money will be spent. If you’re not clear about how your program works, the funder can’t possibly have confidence that you will spend the award responsibly. Be sure to list specifics about who, what, where, and when regarding your program and make sure you connect these specifics to your problem statement. In other words, you’ve developed your program a certain way for a reason-explain why. In some cases, you will apply for organizational funds which are not specific to a particular program. The same concept applies. Are you clear about your organizational goals and how this funding will help you execute them? Do we have a clear set of intended outcomes? Funders want to make an impact with their grant awards. What’s one of the best ways to measure their impact? Through data and results reported back from their grantees. You should absolutely have mechanisms in place to measure how successful your program is at improving outcomes. This requires, of course, for you to have a set of predetermined program outcomes. How do you expect your participants to change in terms of behaviors, skills, knowledge, or attitudes? Be sure to develop realistic, measurable outcomes. The point is that you want to be able to measure how your participants changed after being exposed to your program. Knowing how you expect them to change makes it easier for you to figure out how to measure whether it happened or not. When you can walk through these thought processes and detail how you plan to measure and keep track of program success, you instantly gain credibility from a funder. If there’s nothing else you’ve learned from this post, it’s this: make sure you are clear about your mission, strategic plan and direction for your organization. The more refined your strategy, the easier it will be to make your case to funders. Once you're ready to conquer your first grant, use our checklist to determine if a grant opportunity is the right move.